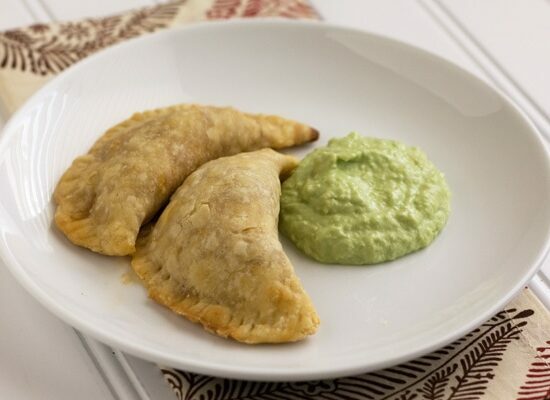 Chorizo Empanadas with Avocado Cream are loaded with spicy Mexican flavors enclosed in a buttery pastry crust, perfect for lunch, appetizer, or dinner! Texture: Oh that crust. It’s simply wonderful. Along with chunks of chorizo, potatoes, and creamy avocado it’s heavenly. Appearance: I have yet to see an empanada that didn’t look scrumptious. Ease: The dough recipe is ridiculously easy. I made the dough and filling a day ahead of time so that all I would have to do is assemble. Pros: So freaking delicious. And the empanadas keep well in the fridge and taste just as good reheated in the oven. Cons: None. Except maybe not the healthiest food ever. Oh empanadas. You little portable parcels of buttery goodness. Just typing this post up is making me sad that there are no more of you little pastries left. The last time I made empanadas I used beef & cheese as a filling. I really didn’t think it could get much better than that. But oh, it can. Switch out the beefy cheesy filling for a spicy sausage one and add a side of creamy, tangy sauce to offset the flavors and WHAM. Even better. Making empanadas can be quite laborious (but so worth it). If you’re low on time, make the dough and filling up to 2 days ahead of time. That way on serving day all you have to do is assemble, bake, and throw together the avocado cream. Easy as (savory) pie. Heat water and butter in a medium saucepan over medium heat until butter has melted. Let cool slightly. Mix flour, salt, and paprika in a large mixing bowl and make a well in the center. Pour melted butter mixture into flour mixture and mix with your hands until you get a wet, oily dough. Shape dough into a disk and wrap in plastic. Refrigerate for at least 2 hours or overnight. Heat a large skillet over medium-high heat and add chorizo, breaking apart into small pieces, then add onion. Saute until chorizo is cooked through. Turn off heat, add diced and boiled potatoes, and let cool completely. While the filling is cooling, preheat oven to 400 degrees F. Spray a large baking sheet with non-stick spray or line with parchment. Tear off pieces of dough to roll about 20 golf-sized balls. Using a rolling pin, roll out dough balls on a lightly floured surface into 5″ circles. Place 2-3 tablespoons of cooled filling into the center of each dough circle. Fold dough over filling to make a half-moon shape and press edges firmly to seal. Crimp with the back of a fork. Place empanadas on baking sheet and bake until golden brown, 15-20 minutes. Let cool. 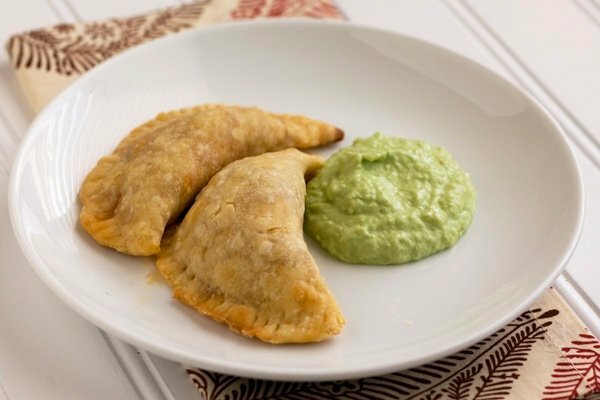 While the empanadas cool, place sour cream, half and half, lemon juice, and jalapeno in the bowl of a blender or food processor. Blend until smooth. Peel, pit, and dice the avocado and add to blender. Blend until smooth and creamy. Season with salt. If not serving immediately, wrap tightly with plastic wrap, pressing plastic onto the surface of avocado cream to prevent browning. These sound divine. I've always been a little scared of empanadas for some reason but they seem simple enough. That avocado cream sounds good enough to eat by itself…by the spoonful! Oh…my…god…These look sooo good! And that avocado dipping cream? WOW. No wonder they are all gone! Yum-o-licious! Especially with that avocado cream! These look amazing! Let's see what they do on Stumble! Ive never had an empanada but i ADORE pastry in every form, and cornish pasties are one of my all time favourite things, so im pretty much bound to love these 🙂 chorizo lover here also so basically…this post is amazing! wow, looks delish. i've never seen a pastry dough with melted butter before–only frozen or very cold. interesting method! i must try it out! There is a well known empanada place ins Morristown NJ. It is just a little hole in the wall but it sells fantastic empanadas and only empanadas. I had the fortune of eating from there a few months ago and making my own has been on my list of things to do for quite some time. Thanks for this recipe, I am going to be making them as soon as this heat lets up. Oh, these look incredible. Yum! If you can’t eat avacados, what would be a good thing to serve with these?